It was a pleasure to recently be awarded 3 ribbons at the Sydney Quilt Show, for "Delightful Daisies". 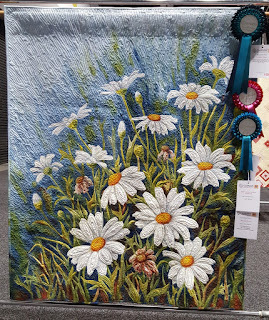 They were 2nd place, Pictorial; Best use of Dyes and Pigments and Judge's Choice. Every one of my prizes is fabulous and so much appreciated.